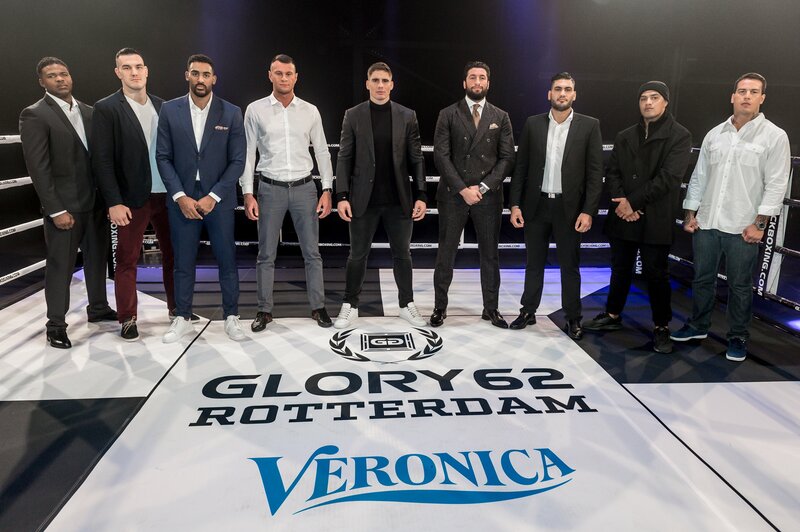 On Saturday December 8th, GLORY kickboxing returns to Rotterdam with GLORY 62. Headlining the event is an eight-man, one-night heavyweight tournament with $150,000 in prize money and a potential showdown with heavyweight champion Rico Verhoeven on the line. 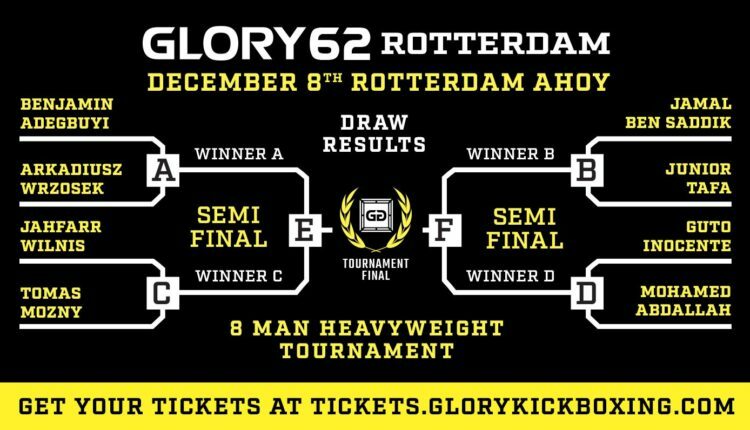 On December 1st, the brackets were finalized for the tournament set for the Rotterdam Ahoy, seeing Benjamin Adegbuyi as the top seed of the tournament. The top seeded Adegbuyi is in the midst of a three fight winning streak, and has lost only to Rico Verhoeven and fourth seeded Guto Inocente over his four years inside the GLORY ring. He faces eighth seeded Arkadiusz Wrzosek, who makes his GLORY debut on December 8th, with an 11-4 record prior to facing Adegbuyi. Jamal Ben Saddik will face off against Mark Hunt protege and hard-hitting prospect Junior Tafa, who has gone 3-2 as a pro. Saddik looks to continue his winning ways, after he broke a two-fight losing streak at GLORY 59 against D’Angelo Marshall. Jahfarr Wilnis, who handed Ben Saddik one of his two more recent losses, comes into GLORY 62 as the third seed of the eight man tournament, looking for a bounce back win in the first round against Tomas Mozny. If Wilnis is able to make it to the semi-final, he can possibly face Adegbuyi, who handed him his most recent defeat at GLORY 58 in Chicago. Rounding out the first round is the aforementioned Inocente, who’s most recent effort came in a loss against heavyweight kingpin Rico Verhoeven at GLORY 59 in September. Mohamed Abdallah chose Inocente as his opponent following the December 1st drawing of the bottom four seeds, looking to make an impression against the recent title challenger. 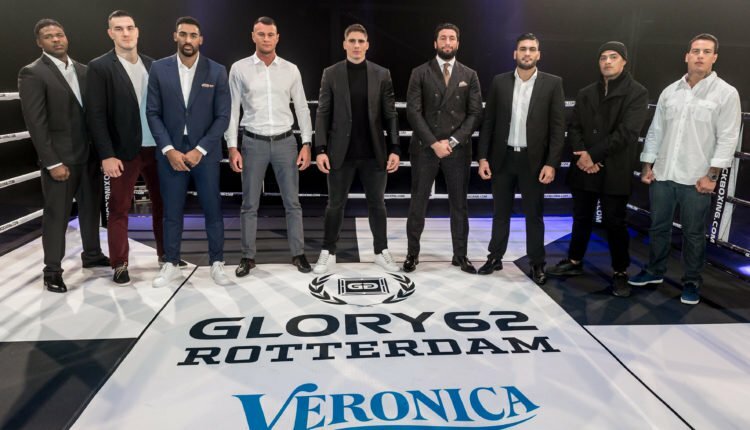 The complete fight card for GLORY 62 can be seen below.